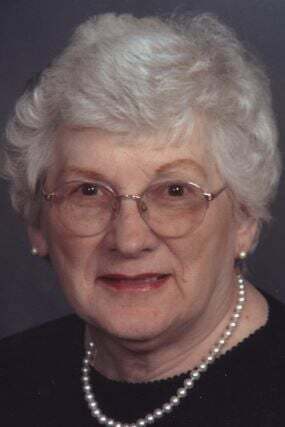 Dorothy (Dee) K. Sieger, 98, of La Crosse died peacefully Tuesday, Nov. 6, 2018, at the Brookdale Senior Living Facility in La Crosse. Dorothy was born Oct. 26, 1920, in Arcadia, the daughter of John W. and Mary (Kovahl) Kamla. The Kamla family lived at and operated the East Arcadia Mill and Dorothy graduated from Arcadia High School with the class of 1938. After the family moved to La Crosse, Dorothy studied business at what is now the Western Wisconsin Technical College. Dorothy worked at the Trane Company prior to marriage and for many years in the purchasing office of the University of Wisconsin-La Crosse. On July 14, 1945, Dorothy married LeRoy J. Sieger at the Holy Cross Church in La Crosse. The ceremony was officiated by her brother, the Reverend Jerome Kamla. Through 58 years of marriage, Lee and Dorothy enjoyed classical music, the opera, travel, wonderful friendships, but most of all spending time with family. Dorothy is survived by four sons, Pete (Kathi) of Minneapolis, Bob (Debi) of Madison, Wis., Tom (Myrt) of Madison and Bill of Chicago; one daughter, Diane (Scott) Brose of La Crosse; nine grandchildren; and 11 great-grandchildren; and many nieces and nephews. Dorothy was preceded in death by her husband, Lee; her parents; and three siblings, the Reverend Jerome Kamla, Monica St. Jacques and Joachim (Jim) Kamla; as well as brother-in-law, Leo St. Jacques Sr.; and sister-in-law, Cornelia (Cornie) Kamla. A Funeral Mass will be held at 10:30 a.m. Monday, Nov. 12, in the Marian Chapel of the St. Joseph the Workman Cathedral, 530 Main St., La Crosse. Msgr. Charles Stoetzel will officiate with entombment to be held in the St. Francis of Assisi Mausoleum in the Catholic Cemetery, La Crosse. Friends may call from 9:30 a.m. until the time of Mass Monday in the Marian Chapel. The Blaschke & Schneider Funeral Home is assisting the family with arrangements. Online condolences may be made at www.blaschkeschneider.com. In lieu of flowers, donations can be made to St. Joseph the Workman Cathedral or Aquinas High School. The family would like to thank the wonderful care provided to Dee by the Brookdale Senior Living staff in La Crosse.